Fire 'n Ice Watermelon Salsa, made with bell pepper, jalapeno, red onion, garlic, lime and cilantro, and watermelon, shown here with my grilled shrimp and Frozen Watermelon Margaritas. I have already been eating cucumbers, cantaloupe, strawberries, watermelon and tomatoes, like I'm never gonna see them again, and summer only just arrived. Far as I'm concerned they need to move the official beginning of summer up, and just cut spring short, because in the Deep South spring is, oh, I don't know... about two weeks at most I'm guessing. Summer heat and humidity run right on in like it's been waiting. Much of the rest of the country has been pretty hot too from what I'm seeing, so clearly it's not just the south. At least some of y'all do get a reprieve once in awhile. We don't, at least not until it's pretty much winter. Apparently my body just needs hydration or something, because those cooling foods absolutely have been a regular part of my diet here lately. I'm a big fan of salsa too - I'll eat it jarred, of course, but frankly I love it fresh-made the most, whether it's a garden fresh style, or a juicy salsa with beans or even corn, I'm eager to dig in with some tortilla chips. 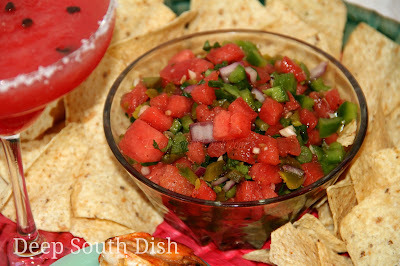 I paired up some of the elements of the fabulous Fire 'n Ice Summer Salad I love so much, with watermelon, for my take on a summertime salsa and something just a little bit different from the norm. For this version, watermelon steps in for tomatoes, and it is a cool, refreshing and delicious substitute. Serve with tortilla chips as a dip as shown of course, (a couple of those frozen watermelon margaritas would pair up nicely too), but this can also be used as a garnish with grilled foods like shrimp, or as a condiment on burgers, in wraps, on sandwiches, tossed in salads, on tacos, huevos, in quesadillas and other Tex-Mex meals. If you're having a party, double the recipe and use the shell of the watermelon as your serving bowl. Great for that cookout or just for snacking. Here's how to make it. Place a colander over a bowl. Dice the watermelon and add to the colander; toss with the teaspoon of salt. Cover and refrigerate several hours or overnight to drain; toss and drain off excess juices occasionally. When ready to serve, mix all of the remaining ingredients together except for salt and pepper. Add mixture to the watermelon, toss and taste. Add salt and pepper as needed. Serve with tortilla chips as a dip, use as a garnish with grilled foods or as a condiment on burgers, wraps, sandwiches, salads, tacos, huevos, quesadillas and other Tex-Mex meals. Cook’s Notes: As the salsa sits, it will continue to release excess liquid. Stir occasionally and drain off any accumulated liquid, if desired. I prefer to use pickled jalapeno peppers over fresh, but either will work. Be sure to wear kitchen gloves if you’re working with raw jalapeno peppers and remove seeds and ribs to reduce heat. I really love your blog and every recipe I've tried so far has been wonderful, will their be a kindle version coming out for your cookbook? Thank you so much! I actually did request one from my publisher, but since I'm a Kindle user, I want it to be right!! Down the line I'm hoping we will have one. That really IS a perfect combination & happens to be my favorite jam too!! I'm so glad that you enjoyed making the biscuits and that you're enjoying the cookbook but most especially for taking the time to let me know!! This would go well with gyros too or yeah, grilled lamb. Nice one, Mary. Hello Ma'am, how much freshly ground black pepper would you put in this? Half a teaspoon? I like to cook for friends and famuly but due to a medical condition, the taste receptors on my tongue are dulled so when a recipe says 'salt and black pepper to taste' it stumps me. Thanking you kindly.